Nicole Rahaman, for the Respondent. ZINN J.:– I informed counsel following the hearing that I was granting this application for judicial review on a narrow ground based on information recently discovered by counsel for the Applicant. These are my brief reasons for so doing. Mr. Akbar is a citizen of Pakistan. On May 7, 2002, he came to Canada and on May 16, 2002 filed a refugee claim. Mr. Akbar’s refugee claim was based on religious persecution. As a minority Shia Muslim in his village, and a public representative of the Shia denomination, Mr. Akbar claimed that he was persecuted by the Sunni Muslim majority, and in particular by the Islamic fundamentalist group Sipah Sahaba Pakistan (SSP). Mr. Akbar also claimed to have been persecuted by the local police, who he stated were under the influence of this group. 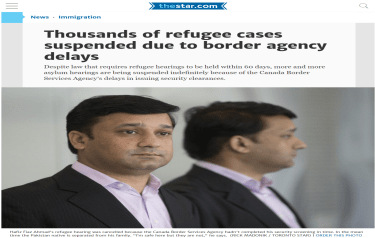 Mr. Akbar stated that he was threatened on multiple occasions by the SSP, but that there were six alleged incidents that were particularly noteworthy, and which caused him to seek refugee protection in Canada. On April 30, 1999, the SSP attacked his house, and ordered that his hand be cut off as a form of public condemnation for practicing the Shia faith. Mr. Akbar was hospitalized for four days, and he was warned to stop his religious activities. This incident was reported to the police, but no action was taken. On September 24, 2001, Mr. Akbar’s house was again attacked in response to a religious meeting he had organized. The matter was reported to the police, but Mr. Akbar was detained for provoking tension in the village. On December 20, 2001, Mr. Akbar was attacked while he was tending to the Shia symbolic horse Zuljinnah, requiring two days of hospitalization. The matter was reported to the police, but no action was taken. On or about April 26, 2002, Mr. Akbar was arrested for holding a rally to denounce the recent killing of Shias in another part of Pakistan. On April 30, 2002, Mr. Akbar’s house was again attacked, but he managed to escape out the back door. Sometime between April 30, 2002 and May 7, 2002, after Mr. Akbar had fled to Lahore, his village house was attacked and his wife and children beaten. Shortly after this last incident, Mr. Akbar arranged to travel to Canada to claim refugee status. On March 2004, the Refugee Protection Division (RPD) rejected Mr. Akbar’s claim. The RPD disbelieved Mr. Akbar’s allegations because he stayed in Pakistan following various assaults by the SSP, and also because he left without his wife and children who had also been threatened by the SSP. The Board also stated that objective evidence indicated that the SSP had been banned by the government and the government was taking steps to counter any SSP activities. The Board acknowledged Mr. Akbar’s amputated hand, but was not convinced that the SSP was responsible for the injury. As a result, the Board concluded that Mr. Akbar was neither a Convention refugee nor a person in need of protection. Mr. Akbar sought leave to judicially review this decision, but his application was dismissed on July 7, 2004. On July 18, 2005, Mr. Akbar filed an application for permanent residence based on humanitarian and compassionate grounds, and on June 20, 2006, he filed a PRRA application. In his PRRA, Mr. Akbar reiterated his allegations of abuse at the hands of the SSP. Mr. Akbar also alleged that he would suffer abuse at the hands of the police who were effectively agents of the SSP in his community. He submitted two new pieces of evidence that were not before the Board. The first piece of new evidence was correspondence from Mr. Akbar’s lawyer in Pakistan. It was the Officer’s consideration of this evidence, or rather his lack of it, that has resulted in an unreasonable decision. The Officer discounts the correspondence from the lawyer. He writes: Mr. Akbar submitted a letter from Ch. Shahnaz Ahmad, Counsel dated 10/7/2007, in which he says that a compliant is still in force at the police station and that they are awaiting the applicant’s return to proceed with the investigation. However, the nature of the complaint is not specified, and counsel did not submit a copy of the complaint. I give little probative value to the letter because of the lack of details about the nature of the compliant makes it impossible for me to determine whether or not Mr. Akbar would be subject to persecution, torture, threats to life, or cruel and unusual treatment or punishment if he returned to Pakistan. Although this letter dated 10/7/2007 is contained in the Application Record, it is not contained in the Certified Tribunal Record. However, given the specific reference to it in the decision, there is no doubt that it was considered by the Officer. Counsel for the Applicant noted just yesterday that the Certified Tribunal Record does contain a letter from Ch. Shahnaz Ahmad, Counsel but it is a previous letter and is dated 5/4/2006. That letter, which was not in the Application Record, but which is referenced to be included with the initial PRRA application, sets out precisely the detail the Officer said was lacking in the letter dated 10/7/2007. The letter appears on its face to be material to the PRRA application and as it provides precisely the information the Officer found lacking in the subsequent letter may have resulted in the Officer assigning some weight to this lawyer’s information. It is not plain and obvious to me that the Officer would have reached the same conclusion had he considered this evidence. Accordingly, the Officer’s decision is unreasonable and the application must be re-determined by another officer. Neither party proposed a question for certification. THIS COURT ORDERS AND ADJUDGES that this application is granted, the decision of the PRRA Officer dated October 30, 2008 is quashed and the Applicant’s PRRA application is remitted to a different officer for a determination and that officer is specifically directed to consider the two letters from Ch. Shahnaz Ahmad dated 5/4/2006 and 10/7/2007, respectively.